They look quite nice, and I'm not so dissapointed with the 2mm needles as I thought I would be. I will use them again. I have a big bunch of yarn over (it's handspun handdyed merino from Hello Yarn). I'm going to use it with some kind of slipped stitch pattern, I already bought the black yarn to combin it with! Just need to figure out how to wind it in 2 identical balls so I know I'll be using the same amount for each sock! 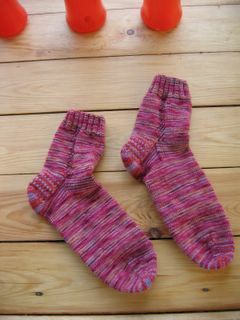 Yesterday I started some regular basic socks with the yarn I died myself and the stripes are looking really need! As I know I won't have enough for regular socks (I only died 50grams) I'm using purple yarn for the heels and toes. I also printed a bunch of free patterns from the Internet, all sock patterns. I can't wait to get started on them! I also can't wait to start dying yarn again, I got about 10 skeins of white sock yarn at the store on Saturday. But my next project will be the cascading leaves I think. I hope to get my books in the mail someday, I really do. I want to order more books with sock patterns, but I'll do it over here as I will at least get them then. I'm off to bed now to hopefully get some knitting done. I had to sew a bunch of stuff for work today, have to work extra hours tomorrow and on Wednesday, but I'll probably get off early on Friday. Want to knit! That's my yarn? Yay! They're absolutely beautiful socks!